To say that Pound Farm Farmhouse is a holiday cottage is ever so slightly doing it a disservice. "Pound Farm Farmhouse" is, as the name suggests, an old farm house, and as such is quite a large affair; Pound Farm Farmhouse sleeps 10 people, so is a good place to take a holiday with friends and family. 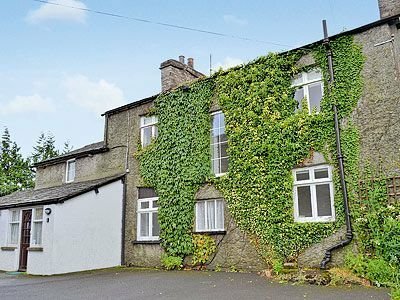 Located in a small village called Crook, which is just outside Kendal, Pound Farm Farmhouse is ideally placed to enjoy the Lake District National Park; but you're also fairly close (not too close though) to the M6 - so getting here isn't a worry either. Should you want to get outside and see the sights, you'll find there is plenty of walking and cycling to be had - with cycle paths straight from your holiday home. Or for something a little more challenging, The Langdale Pikes and the Old Man of Coniston are a short drive. The popular towns of Windermere and Bowness are a short drive away from Pound Farm Farmhouse, and have a good selection of pubs and restaurants, as well as some lovely little boutiques to discover. Pound Farm Farmhouse sleeps 10 people in 5 bedrooms, with the bedrooms being made up of 3 doubles and 2 twin bedrooms. Heating is provided by gas central heating; a TV and DVD player, washing machine, tumble dryer and dishwasher are also included. For those with pets, you'll be pleased to hear that Pound Farm Farmhouse is "pet friendly", which means anyone in your holiday party can bring their pet with them. Pound Farm Farmhouse enjoys a great rural location, and makes a fantastic place to get away for a few a days. You can enjoy the walks; the cycle rides; the cruises on Lake Windermere; or just sit and enjoy the views out across the countryside. The photo on the left shows the views you can get while enjoying a cup of tea in the conservatory. Holidays at Pound Farm Farmhouse start on a Saturday.